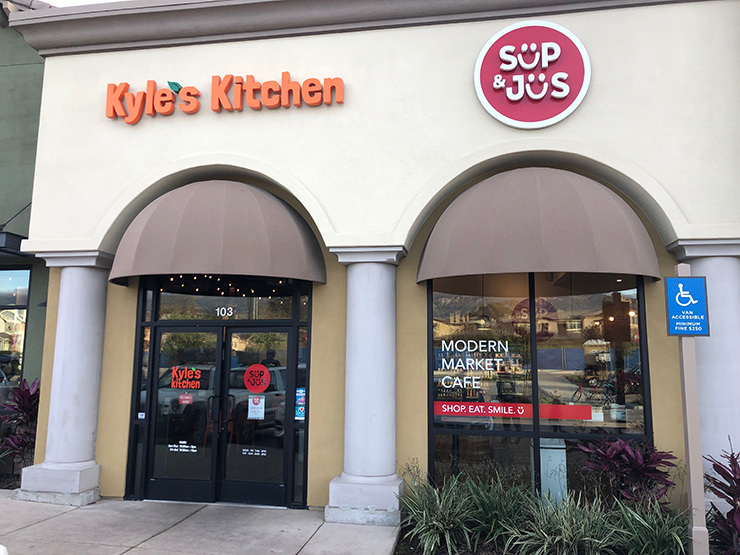 Sup & Jus has opened at 7060 Hollister Avenue in Goleta (near Smart & Final), sharing space with Kyle’s Kitchen. 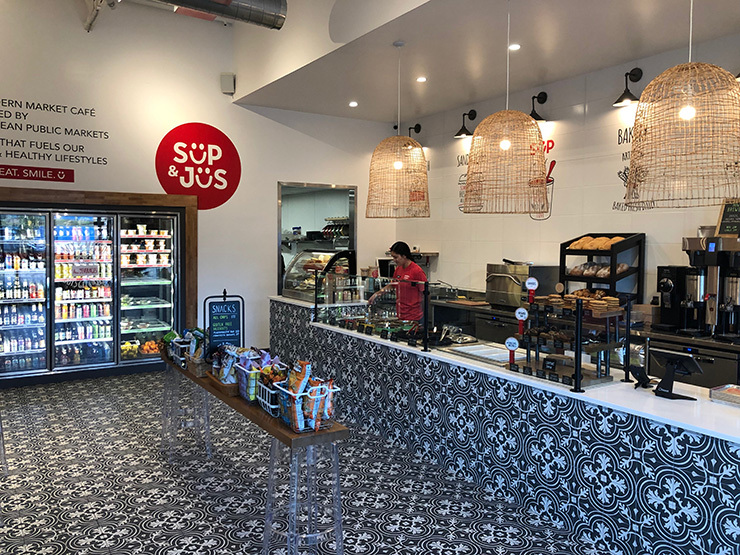 Sup & Jus offers fresh-pressed juices, homemade soups, assorted hot side-dishes, sandwiches, cookies, snacks, and pre-made salads. While I was in the house the hot cart included Chicken with Wild Rice Soup, New England Clam Chowder, Chicken Enchilada Soup, Lasagna Soup, Lentil with Chick Pea Soup, Ancient Grain Minestrone, Beef Chili with White Beans, Spicy Cauliflower, and White Cheddar Mac & Cheese. The dessert cabinet was stocked with Health Bar Crunch, Royale, Chocolate Chunk, Lemon Cooler, Caramel Rockslide Brownie, Toffee Crunch Blondie, Triple Chocolate Brownie, and Totally Oreo Brownie. The eatery also has a wide variety beverages including juices pressed daily, beer, wine, champagne, cider, smoothies, and more. When you buy any 5 beverages you get a 6th one free, available for take-out with a handy cardboard six-pack carrier. Hours are currently 10 a.m.-8 p.m. which will expand in a couple of weeks to 7 a..m. when Sup & Jus rolls out their breakfast menu that will add breakfast burritos, pastries, and a variety of morning necessities. Visit supjus.com. Great idea, odd location. Wish they had this at the Kyle’s Kitchen downtown, I’d stop by at least a couple times a week. Not at all odd for the many that live/work in west Goleta. Just stopped by for lunch today and was pleasantly surprised. Everything looks really fresh and they have an unexpected wide variety for such a small space. Staff was helpful and friendly and gave some free soup samples. As someone who works nearby, I often find myself rushing to grab a quick lunch between meetings and I can absolutely see myself (and others in similar situations) coming here at least once a week. So glad they’re here! Completely a waste of space 1 year max…. we live in the US not Europe ware you shop like that in big city. I’m confused- You don’t buy fresh-product foods or juice for breakfast or lunch unless you live in Europe or a big city? Weird. I guess we’re only supposed to get Chick-fil-a or Mcdonalds if we want a quick bite or snack? This concept is no different then Starbuck’s deli options or Panera bread- it’s just local and not on a large chain scale. Don’t be, it comes from one that can’t even spell where. Wow. Kind of an odd if not nasty comment to make about a new business. Your negative comment makes me want to go there and support them.